The game began with a jolt from the Washington Capitals bench. Alex Ovechkin was involved early when a hit on Florida’s Kris Versteeg spawned the games’ first and only fight. It was more of a match between sumo-wrestlers, as both players limited their punches and instead chose to bear-hug until it was broken up by the referees, but, Versteeg’s cross-check to Ovechkin that started the fight, resulted in the Caps’ first power play. Mike Ribeiro, the Caps most potent offensive threat at the moment, found a puck crossing through the low slot area, and knuckle-balled a back hand shot past Scott Clemmensen for the Capitals, giving them the game’s first lead. It wasn’t long, however, as ex-Cap Tomas Fleischmann’s slap-shot deflected off the leg of John Erskine, and past Holtby, tying the game at one. 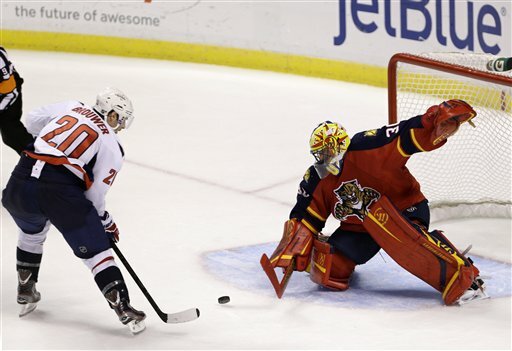 Florida’s Shawn Matthias gave Florida their first lead of the night when he slapped a puck passed Holtby, and the Panthers took a 2-1 lead going into the first intermission. The Panthers and Caps continued to trade goals and scoring chances throughout the second period. Karl Alzner tied the game at two, scoring on a blast from the left point, his first of the year. It was Florida rookie Jonathan Huberdeau that broke the tie shortly after, redirecting a puck past Braden Holtby, and Matt Hendricks finished with a beautiful backhander, assisted by Alex Ovechkin to tie the game at three. Huberdeau struck again in the second, tapping in his own rebound, giving the home team the 4-3 lead going into the final stanza. The third period proved to be the most intense, exciting, and if you’re a Caps fan, satisfying. Unfortunately for the Caps, however, things got worse before they got better. a bad break, and controversial officiating, lead to Florida’s fifth and final goal. A puck thrown from behind the net was snagged by Caps net minder Holtby, but he was unable to corral the rebound. The ensuing scramble caused a linesman to blow his whistle seemingly at the same time that Florida’s Drew Shore bat the puck out of mid-air and into the net. After a review, the call, which was originally ruled a goal, stood. Normally in these circumstances, a referee blows the whistle when he loses sight of the puck, and the play is dead, no matter where the puck is. The Panthers lead was stretched to two goals and lead 5-3 with 13:35 to go in the third. the Caps, furious with the call, took out their frustration on their opponents, peppering Clemmensen with nine shots on goal. Eric Fehr got the Caps within striking distance, redirecting a Mike Green shot into the net and injecting life back into the Capitals. On an ensuing power play, the Caps stars shined. Nicklas Backstrom won a face-off cleanly to Mike Ribeiro, who then passed the puck back to Alex Ovechkin who rifled a wrist shot past Clemmensen to tie the game at five and forcing the game to overtime. Troy Brouwer completed the comeback tapping in his own rebound on a breakaway, and the Capitals found themselves victorious in a game that seemed all but over for them. It was a game unlike any of that which the Capitals had found themselves involved in previously this season. It was a one goal game where they captured and early lead, then surrendered it. A game where their goaltending stood tall when they needed it the most. A game where they went 2-3 on the power play. A game where their stars shined brightest when the game mattered most, and a game where they battled through adversity to garner a well-deserved, though sloppy win. Perhaps it is a sign that the bounces are starting to go the right way. The Caps travel to Tampa Bay to take on the Lighting on Thursday night.